This unit is also available for sale at http://knowesys.com. The unit has five main hardware components and a printable case. Links for electronics and 3D printed parts are provided below. 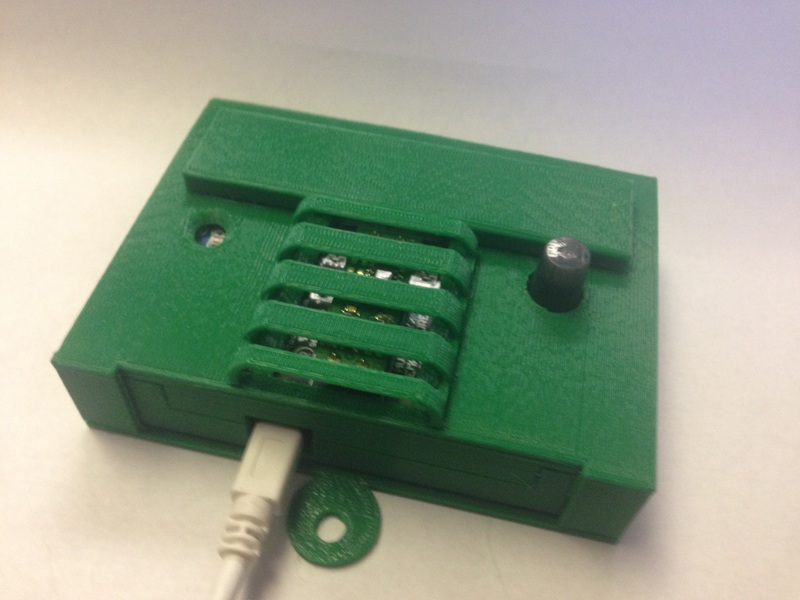 Step 1: Use JST cables to connect port 0 of the Phidget to the temperature output and port 1 to the humidity output. Step 2: Connect the light sensor to port 2. Step 3: Connect the motion sensor to port 3. Step 4: Fit the Phidget board on to the four pins of the case so that it lies flat. Step 5: Slide the three sensors in to their corresponding slots in the case. Step 6: Put each of the two pins in the holes of the round lid. Step 8: Cover the Phidget with the back piece. This locks the lid in place to complete assembly.